NASA's back to the Moon adventure is being kick-started by the building of the Lunar Reconnaissance Orbiter. That probe is the opening volley of spacecraft in response to President George W. Bush's multi-billion dollar Vision for Space Exploration that he outlined in January 2004. A goal of the Vision is returning humans to the Moon as early as 2015 and no later than 2020. To make that happen, starting no later than 2008, a series of robotic missions will be sent to the lunar surface "to research and prepare for future human exploration," Bush proclaimed. 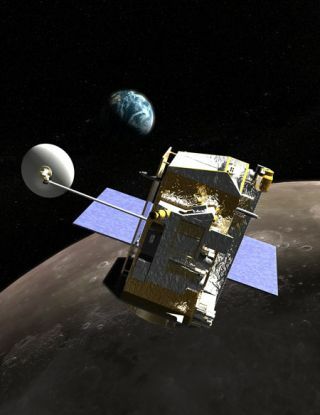 This week, the Lunar Reconnaissance Orbiter (LRO) begins a preliminary design review. A process that is sure to reflect the financial stress and strain status of NASA's newly issued budget for fiscal year 2007. The task ahead for engineers and scientists is to keep LRO on track in order to achieve several goals: To characterize future robotic and human lunar landing sites and to identify potential lunar resources, with emphasis on applied science/engineering assessments. LRO is also to investigate the lunar radiation environment in terms of impact on humans. LRO is the first of the Robotic Lunar Exploration Program missions. After a planned launch by late fall 2008, LRO will take four days to make its way to the Moon and then orbit that chunk of "magnificent desolation" for nominally one year. Now being competitively sought is a co-manifested "secondary" payload on the LRO launch. One idea floating about is ejecting some type of hardware from LRO to demonstrate a "first look" at the polar regions from the Moon's surface. The mission remains an essential "first step back to the Moon for NASA and its implementation of the Vision," said Jim Garvin, Chief Scientist at NASA's Goddard Space Flight Center in Greenbelt, Maryland, which is managing the mission. LRO's topographic mapping capabilities will, in Garvin's view, "reveal for all of us a 'new Moon' that we will be able to utilize on our path to human return and eventual human missions to Mars." The NASA center is acquiring the launch system and spacecraft, as well as providing payload accommodations, mission systems engineering, assurance, and management. "LRO, in all respects, is a unique and challenging planetary mission," Jim Watzin, Planetary Division Chief for the Flight Programs and Projects Directorate at Goddard Space Flight Center explained to SPACE.com. For example, LRO will fly within 31 miles (50 kilometers) of the lunar surface for at least one year in order to conduct a comprehensive and detailed mapping mission. That's a feat that has never before been attempted, he noted. "Low lunar orbit, at the precision mapping altitude of 50 kilometers, is substantially different from our experiences at other planets," Watzin said, underscoring the relatively stable and benign environments of Mars orbit, or Earth orbit for that matter. Watzin said that low lunar orbit is inherently unstable, due to the asymmetry of the lunar gravitational field. LRO's orbit would oscillate and collapse to the point of collision in about two months time if not properly maintained through active propulsive means, Watzin advised. Furthermore, Watzin said that as LRO swings around the Moon it will be exposed to dramatic temperature shifts. Another tough duty for LRO is its precision mapping mission, requiring large volumes of data that must be collected and transmitted back to Earth. "This requires a data system with capacities similar to many low Earth orbiting satellites...but exercised over a far greater distance with less power and weight than typically allotted," Watzin said. "In almost all aspects, this is a challenging mission," he reemphasized. Whisking over the lunar landscape, LRO is slated to relay unique close-up imagery. On the priority list is catching sight of small-scale features that could be landing site hazards for both robotic and human explorers. It also will survey the lunar poles to record changing illumination conditions and potential resources at those locations. On the LRO camera-sweep agenda are trips down memory lane too, said Mark Robinson of Northwestern University's Center for Planetary Sciences in Evanston, Illinois. He is Principal Investigator for the Lunar Reconnaissance Orbiter Camera (LROC). Take note. For you "Apollo landings were a hoax" believers LROC's sightseeing abilities should set the record straight. LROC is to image U.S. and Soviet landing sites on the Moon. That includes NASA's Ranger and Surveyor lunar probes, as well as the touch down spots of Apollo expeditionary crews and the impact sites of spent Saturn rocket stages that hurled astronauts moonward. Also on the LROC see list are the Soviet Union's Lunakhod automated rovers, Robinson told SPACE.com. "We will image the Apollo sites and you will see the descent stages sitting on the surface," Robinson said. LROC will clearly see the overall shape of that landing hardware, but won't be able to resolve such things as the insignia on the side of the descent stage, or see the stripes on astronaut-planted flags, he said. Additionally, Robinson noted, given a setting Sun in the lunar sky, LROC should spot the long shadow of descent stages cast across the Moon's crater-pocked terrain. An LROC duty is to better characterize the current impact rate on the Moon of Near Earth Objects (NEOs) from very small impactors up to 33-feet (10 meters) in size for hazard assessment. In the 1960s, NASA's Lunar Orbiter missions acquired meter scale imaging for a small percentage of the Moon, Robinson said, mostly in equatorial mare regions of the nearside. Later Apollo missions (Apollo 15 through Apollo 17) carried very sophisticated high-resolution imaging systems--panoramic cameras--that acquired meter to several meter scale images. "We intend to re-image many of these [panoramic camera-scanned] sites to accurately determine the current small impactor rate on the Moon," Robinson said. Over the stretch of time from Apollo 15-17 to when LRO flies, hundreds of new craters in the 10-meter diameter size are predicted to have been created, he said. LRO will give extra special attention to the relatively unexplored polar regions on the Moon. Unresolved is the issue of polar volatiles as a resource--especially water-ice. The hunt for water-ice on the cold Moon is a hot-button topic. Among a bevy of sensors, LRO is outfitted with equipment to chip away at the ice-on-the-Moon matter. NASA's Lunar Prospector circled the Moon for over a year in 1998-1999, charting levels of hydrogen in shadowed craters near the Moon's south and north poles. That hydrogen signal has been inferred by some specialists as billions of tons worth of water-ice below a modest covering of soil. Earlier, the Pentagon's Clementine spacecraft also hinted that water-ice may be found in sunlight-deprived polar craters. If present, water-ice would be a nifty resource. It could be processed into oxygen, water, and rocket fuel for use by future lunar explorers. Still, whether that icy material is truly tucked away at the Moon's poles is arguable. "There's clearly something going on at the lunar poles that we don't fully understand," said David Paige, a space researcher at the University of California, Los Angeles. He's the lead scientist on LRO's Diviner Lunar Radiometer Experiment. It will chart the temperature of the entire lunar surface at roughly 985 feet (300 meter) horizontal scales to identify cold-traps and potential ice deposits. Paige said there's one thing that's bothersome in the search for lunar ice saga. "It's not a very strong signal" from Lunar Prospector in regards to the enhancement of hydrogen in the Moon's polar regions, he said. "If every place that was permanently shadowed was completely stuffed with ice you'd expect a much bigger signature that we've seen," Paige said. Paige said his Diviner device will provide thermal data that can tell if ice is on the surface, close to the surface, or deep. Coupled with data sets from other LRO instruments the ice chests on the Moon issue can be clarified, he said. "There's no one killer technique" that LRO carries to find ice, said Alan Stern, a planetary scientist at the Southwest Research Institute in Boulder, Colorado and Principal Investigator of the Lyman-Alpha Mapping Project, or LAMP for short. LRO's LAMP instrument will observe the entire lunar surface in the far ultraviolet. "We call it seeing in the dark," Stern said. LAMP's main job is to spot surface ices and frosts in the polar regions and provide images of permanently shadowed regions illuminated only by starlight. "Nothing like this has ever been done," Stern noted. "We're using a clever trick of nature. That is, permanently shadowed regions are dark to sunlight and Earthshine. But in the ultraviolet, the sky is showering photons down from the interplanetary hydrogen glow. So to LAMP...it's not dark at all." Stern said that the whole idea behind LRO--in regards to the water-ice detection--is fly three or four different techniques. "Each has their own pluses and minuses. But the suite of them can let you get the checkmate. They shore each other up in their weaknesses and they strengthen each other with their own pluses," he said.